At 3pm, Fiji time, which turned out to mean more like 3:40, there was a weaving lesson that I went along to with my trusty photographer at my side. The lesson was really interesting and I learned how to make a bookmark and a bangle both of which, I was strongly advised by the girl sitting next to me who was an Australian Quarantine Officer, I could not bring home with me. We got to the bar in time for happy hour and ordered a drink each and very soon along came Opa with his grand-daughter Nadine clutching the game Rummikub and asked if we’d like to play. We did indeed and spent a very happy time playing with the 2 of them. This became a regular feature every evening where we played with Opa and whoever else turned up at the time and I learned the German words for black, red, blue and yellow. I have had a fascination with the German language since high school when my French teacher taught me a few words during lunch times but I really haven’t had the opportunity to study it properly. It was so wonderful to be able to try my skills in such a supportive and appreciative environment as our adoptive family and I truly had a ball. David loved seeing my enjoyment of this and I was surprised at how many words came to mind when I needed them. Sometimes even words I wasn’t aware I knew would just pop up at the right time. Nadine and her dad, Matthias, were particularly helpful with supplying new words for me to learn and try. While I’m on the subject of the family anyway I must say that David and I both completely adored every single one of them. First there was dear Opa, 89 years young and as strong and determined as an ox. Such a sweetie. Then his son Matthias with wife Stella. They were a gorgeous couple and so interesting to talk to with lots of experiences in Germany and New Zealand to share. Matthias is interested in alternate medicine so we had lots to talk about and I told him a bit about raw food and very briefly loaned him ’12 Steps to Raw Food’ to look through. David and I often stayed at the table after meals chatting with Matthias for a while and felt so relaxed as you do in good company. Their daughter was Nadine. Stunning looking, a figure to die for and the most capable, caring grand-daughter any Opa could wish for. We loved watching her as she spoke with him. And two handsome sons Dylan and David who never sat still, always off burning energy as young men will. The entire family dynamics were a pleasure to be involved with and they all got on so well we really were honoured to share their meal table each day and to appear so welcomed by them. Dinner this night was a ‘Meat BBQ’ but there were jacket potatoes, garlic bread and plentiful and varied salads so I had plenty of delicious food as always. We laughingly anticipated how small dessert would be and it didn’t let us down. The ‘fruit salad and ice cream’ was served in a tiny ramekin dish. My salad consisted of 8 very small lumps of assorted fruit and a scoop (didn’t know they made them that small) of ice cream. 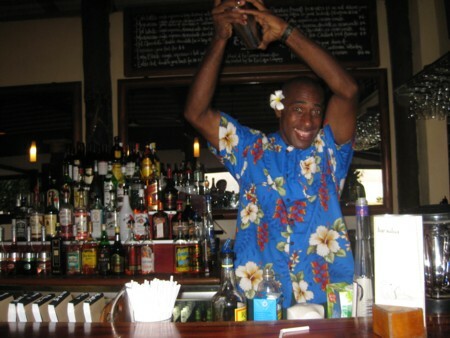 Here’s our favourite barman, he was such a character!!! After breakfast the activity for the day was to go up the stairs and down the other side of the hill to the village for the Easter Sunday church service. David and I joined the group but paced out in front so that we could climb the stairs at a decent speed without being held up if the group stopped and started. That achieved, we were happy to walk slowly down the rough terrain that was the path down; over the tree roots and rocks and potholes, as I’ve already mentioned. This time we were escorted through the pig pens and came to another small set of concrete steps up, and then down onto the beach fronting the village itself. The bures were small, perhaps 2 metres by 2 metres, and most had tin rooves. We found out later that each one usually housed a family of 4 to 6 people. There were people showering, clothed, in outdoor showers and there were a few dogs, chickens and a kitten wandering around. We went between a few bures to a central grassed area that contained, surprisingly, some solar panels and a TV satellite dish, and beyond that was the grand (by comparison to the bures) church building. 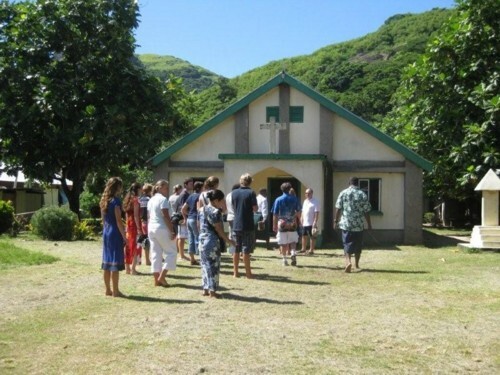 The service was really lovely even though, for the most, part it was in Fijian and we couldn’t understand a word. The sincerity was there and that’s what mattered. The choir were amazing. Not a single instrument to be had but they sang 4 part harmony so well it just gave us all goosebumps. The time passed really quickly though I truly don’t know how long the service went. Perhaps 2 hours for a guess. We’d forgotten to take any money with us for the collection but Matthias kindly allowed us to borrow some from him. 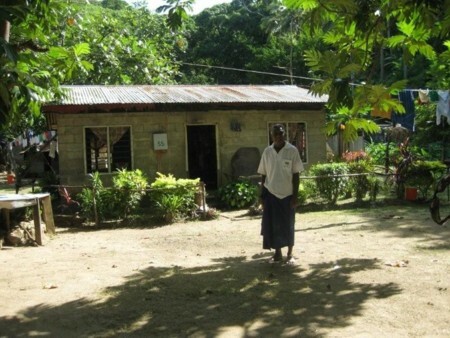 Everything in the resort was charged to our bure so we’d got out of the habit of carrying any money already. David had looked around at the back of the congregation during the service to find men, women and children all seated cross-legged on the floor in the aisle as the 30 or so people from the resort had used about a quarter of the pews but they all smiled broadly at him. No offense taken at all it seems. Once the service was over we went outside to find our shoes which we’d been warned ahead of time to remove before going in. We’d also been asked to wear nothing on our heads in the village or church – not even sunnies pushed up. being picked up and taken back. Opa was not daunted by this at all – in fact he’d been rather offended I think that he wasn’t allowed to walk to the church like everyone else. So for the homeward journey he strode out with his walking stick and really did an amazing job with the rough climb to the top of the hill. The other resort folk went ahead but David and I stayed with Matthias and Opa, chatting happily. I came up with my most difficult German ‘sentence’, telling Matthias there were 177 steps on the other side that we had to go down. I’m probably incorrect in my spelling but 177 in German is ein hundert seben und sepzig. Looks so easy written down but it took a lot of thought and mouth shaping to say it LOL And Matthias was not fooled by our happy chat; we thought we were being so discrete. We were more than happy to be with them but yes, we were also staying just in case of misadventure so that we could go for help and leave Matthias with Opa. Not that we dreamed anything would happen but it was good to feel that all angles were covered. But Opa romped home anyway. got. Isn’t it pretty? 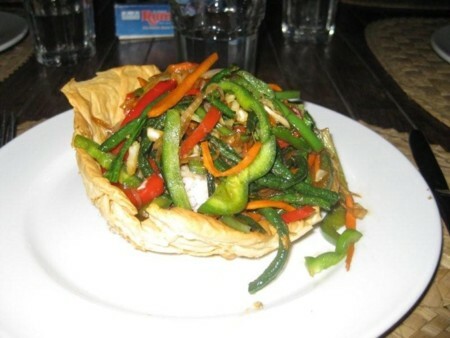 Assorted vegetables served in a filo ‘nest’. [Looking at this photo over a year later my mouth still waters at the memory of that dish!] I didn’t crop the top of the photo as you can see the Rummikub game lurking there hehehe. I think this was the night, as we were just snuggling down in bed, that we heard the shrieks and ‘out of character words’ from Nadine. It seems there was a massive spider in their room which freaked them all out. 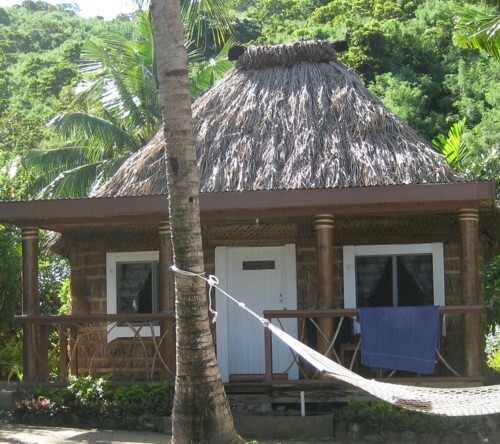 They went to the office who told them everything was harmless in Fiji so they decided they could cope. On the second night they accepted its presence. On the third night they realised it had been dead all along. That made it so funny! But I’m glad it didn’t decide it wanted to die in our bure!!! 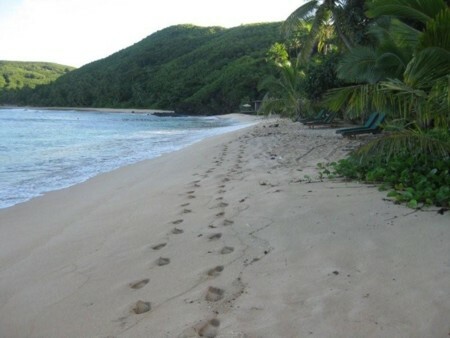 David and I went for an early morning walk on the beach and I took a photo as it looked so cute with just our footprints there. Now I have to mention the wonderfully entertaining and funny hermit crabs. We laughed so much at these every time we walked along the sand because, once you’d become aware of them, it just looked as if most of the shells would be scuttling across the beach until you were a couple of steps from them and then suddenly they’d bob down and be still. If you wished you could feel quite royal as you walked along with all your subjects bobbing down as you approached. It made us very conscious of trying not to step on any shells though! On any beach there are curly shells and there are flat shells and if you picked up any curly shell on this island I can guarantee it had someone housed in it. In any square metre of beach there would have been half a dozen of these dear little creatures. 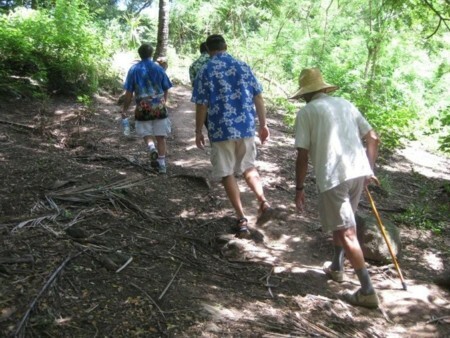 Today’s activity was a climb to the top of the mountain on the island but we couldn’t go as we’d booked a massage. I’m not sure if I was disappointed or not as the hike sounded wonderful but the last of it was apparently scrambling up a vertical rock cliff being ‘assisted’ by the native guide and then teetering on the top with a sheer drop on all sides. Now that part did not sound my scene at all. David has never had a massage in his life and was not going to have one but we had bumped into Matthias and Stella on their way out of the massage hut on Saturday and they’d given glowing reports so David had decided he would give it a shot. As it happens the new massage hut was having some building work done on it so we were ‘done’ in our room. I had the single bed and David the double which meant we were rather low for the poor ladies, and David’s lady had to virtually clamber on the bed with him! But they did a beautiful job and we both had really lovely massages for an hour. Did it convert David into wanting another in the future? No. I’ll try to briefly describe here what the bure was made of. You can see the 4 sturdy poles holding up the veranda in this shot, plus the tall thatched roof and hopefully the dried leaf matting that makes up the walls. 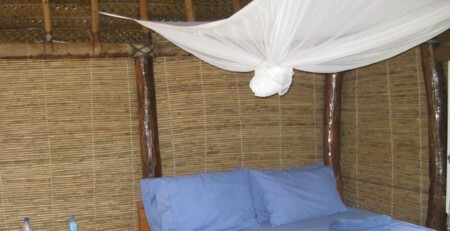 The inside had some lesss-sturdy poles at regular intervals and another layer of the wall matting. You could see a little daylight through the walls in places but it was fairly well covered. 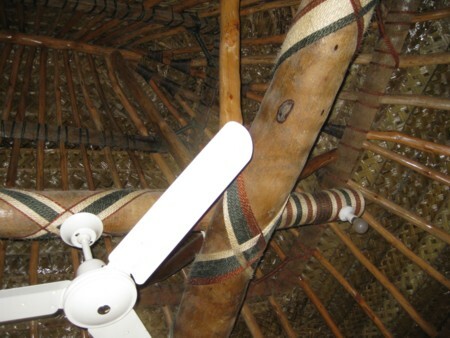 You can also see in the top of this one how the inner roof was plaited from large strips of palm fronds. And lastly, this is looking up into the inside of that tall roof. It was beautifully artistic work with all the palm frond weaving and then the sticks and heavy beams with the decorative rope lashing. 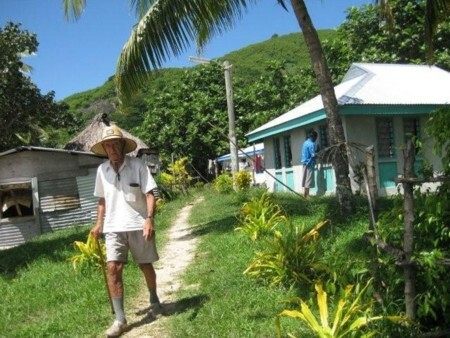 In the afternoon the activity was a tour of the village which David and I decided to go on. Our guide was Tivoli and he was definitely one of my favourite staff members. He had big brown soft kind eyes and a gentle, patient nature. We took the same route as we had the day before because it was the only one LOL Up the steps, over the hill, down the dust track amidst the boulders and tree roots, through the pig pens, up the smaller flight of stairs over a bit of cliff and down onto the village beach. This time it felt OK to look at the bures (homes) there as we’d been invited to do just that, but we still didn’t get to see inside one. And that’s fair enough. It was kind enough of them to allow us to look around at all. We had been encouraged by the resort manager to ask as many questions as we wanted and we all plied patient Tivoli with lots of enquiries. About 300 people lived in this little village, spaced over an area of about 2 acres. I’m hopeless with area estimates but am trying to liken it to 8 of my in-laws’ ¼ acre blocks joined up. Maybe it was 3 acres. held together with concrete which we use for internal walls here in Perth). Most of the rooves were corrugated iron. The only bure we saw with a garden around it was the home that Tivoli proudly announced to be his own. The whole village was nestled amongst a mass of breadfruit trees though we’d passed some huge mango trees on the way down the hill. We were also told that the villagers grew some more crops further up the hill away from our path, which they used for themselves and sold to the resort. Here’s a photo taken on Sunday of Opa and you can see a small bure made of corrugated iron on the left and a really classy bure on the right. The pole in the centre of the photo also appears to have a street light on it which I didn’t notice at the time. There is a similar looking pole in the central grassed area so I guess they have at least 2 lights in the village though I’m positive I didn’t see any on the path from the resort where they’d really need them. blog (well, almost…HaHa!) Great job. I really loved what you had to say, and more than that, how you presented it.